Tamarack Ranch is a family owned, full-service, horse boarding facility, serving families in the Fountain, CO area. Our caring staff and beautiful setting will provide a fine home for your horse. Contact us today! Our ranch is set on 46 spacious acres of land, with plenty of room for horses to roam and for you to ride comfortably. We welcome all breeds of horses and encourage people to stop by and meet some of the gorgeous animals that already live here. Twice a year, we host a veterinary clinic where horses can get routine exams, vaccines, and other treatment with reduced or with no farm call charges. We have a horseback riding trail that’s 20 miles long, as well as a 100’ x 200’ arena and a 60’ round pen for horse training. Our boarding service includes either full or partial horse care, making sure your animal gets the attention it needs while it’s with us. The property was originally operated as a dairy farm in the early 1900s. The Simmons family bought the property in 1950 and began raising cattle while growing alfalfa, corn, and cane. In 1998 the horse boarding operation was started by Dwayne and Gretchen Simmons and later named Tamarack Ranch. The 4th generation of the Simmons family is now living on the ranch. 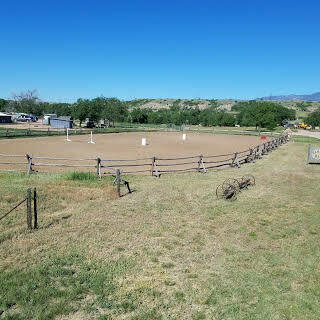 From our 45 acres of sprawling, scenic landscape, to our cleaned-daily horse stables in Fountain, CO, you’ll find everything your horse needs to live happily and healthily here. Many owners turn to us exclusively for horse boarding in Fountain, CO, however we offer so much more! Aside from partial- and full-care, we also offer space for horse training. Use our 60’ round pen enclosure for simple training, then move up to our larger 100’ x 200’ arena for more advanced training. Just looking to enjoy some leisure time with your horse? Roam the entire ranch or step onto more than 20 miles of trails just waiting to be explored. Visit us today and see our facilities for yourself—we promise you won’t have any reservations about boarding your horse with us. Looking for a place your horse can have space to roam and get the care it needs? Board with Tamarack Boarding Ranch today and make sure it gets the absolute best accommodations.